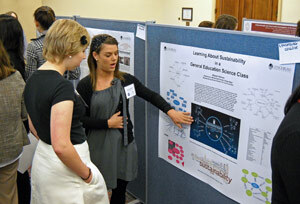 Allyson Harmon ’13 presents a poster at the Washington Symposium and Capital Hill Poster Session. Students tackle such topics as breast cancer, water quality, faith in elections, and the physics of music during the Student Scholar Showcase April 13. Lynchburg MayorJoan Foster ’69, ’70 MAT., ’85 MEd has declared the week of April 11-15“Undergraduate Research Week” in Lynchburg. About 40 students received professional development grants from the College to travel and participate in these conferences. The fourteenth annual Student Scholar Showcase provides students with an opportunity to present their scholarly research, and creative and/or service-learning projects to the campus community in Memorial Ballroom, the Daura Gallery, and Sydnor Performance Hall in Schewel Hall. Student projects can include scholarly papers, creative writing projects, scientific or historical research projects, or performance arts projects, and may be presented in a variety of formats, including oral presentations and posters. Check the full schedule and a PDF of the presentations.